Another great woodie from Knoebels. This one offers great twists and turns and a pretty decent drop. It also lasts a pretty long time for a coaster. And make sure you smile for the camera! 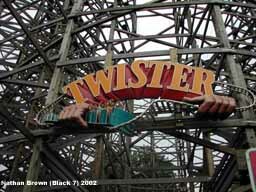 While Phoenix is all about airtime, Twister is all about out of control. For the most out of control rides on Twister, evening/night rides are a must when its really cranking! The speed on Twister also NEVER lets up. The laterals are extremely intense on this coaster, and when there is airtime its pretty good as well. The highlight of the ride for me is the sharp, fast turn right before the double helix. INSANE! My night ride on Twister was one of the most intense rides Ive ever had on any coaster in my life. The front is a must! 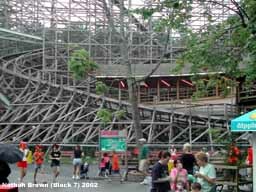 You know, it is fitting that Knoebels has went the way of the "Wood Only" club when it comes to their major coasters. Knoebels itself sits nestled into a valley amongst the many trees of the east-central Pennsylvania mountains. As you traverse the park, one thing you see plenty of are more trees, and many areas seem almost forest like with trees all around. Therefore, what better way to complement that setting than with 2 premier examples of wooden coaster design – the mighty powerhouse Phoenix, and this twisted beauty, Twister. Truthfully, I’m almost thrilled that we went to Knoebels in the post-Whirlwind days, as from what I’ve seen and heard that coaster just didn’t quite fit right with the beauty and ambiance that defines Knoebels. If they ever do go steel with a coaster installation again, I say keep with the classic feel and bring in a Schwarzkopf. Until then, just keep with the current philosophy that "wooder is better". 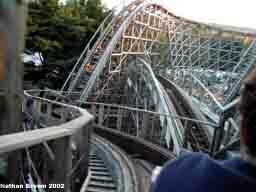 Wooden coasters are just what Knoebels does best, and that truth is reiterated by the outstanding wooden addition from 1999, Twister. 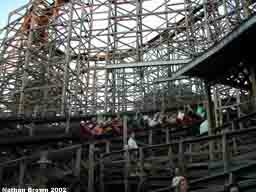 In actuality, a trip to Knoebels is so much like a trip back in time, back to days when wooden coasters were the only game in town. There were no behemoth steel giants, no massive tangles of twisting steel track, no launches of varying type and intensity. The tools of the trade were simpler, and if you had a roller coaster, it had lumber and nails/screws. That’s where Knoebels shows off its charm, as the wooden greatness of yesteryear is brought back to the forefront in this park of nostalgia and sheer happiness. Entering Knoebels, Phoenix hides itself in the back of the park, and the only coaster you can really see right away is Twister. The structure of the ride is truly magnificent, especially after you walk across the little bridge and first get a good look at the coaster up close. The twisting, intertwining layout darts in, out, and around itself many times and leaves any true coaster fan in awe of its appearance. Once you wipe away the drool from watching the coaster fly through its paces, you enter the queue under the twisting signage of the ride. The waits here are rather minimal, as the Knoebels crew is truly top-notch and keeps lines moving very quickly. I never had a wait longer than 15 minutes for any of my 5 terrific rides. I give this woodie a ten because its really like nothing that I have ridden before. You dont get to the top of the lift hill until about half way through the ride. The speed is good and it beats you up a little. If it had some air time it would make it into my top ten. I really enjoyed this ride. To be honest I didnt even know it was located at Knoenbels. So needless to say I was excited to see another woodie there. I really enjoyed this ride. I thought the design of the ride was very unique and it had a lot of surprising parts. This is a pretty good wooden coaster and if it shared a park with any other wooden coaster, I may be fooled into giving it a higher rank. However, since it shares the roost with Phoenix it becomes obvious that this coaster is a couple of steps down from it. The ride is a bit rougher than Phoenix, and lacking in airtime compared to the Phoenix, but compared to most other wooden coasters it is still very good. Great woodie. In fact I found it to be a much more enjoyable coaster than Phoenix. Great layout with a tremendous drop. My only knock would be I was expecting it to be a bit faster and more powerful. Overall though this is a world class coaster. It's a very nice woodie. 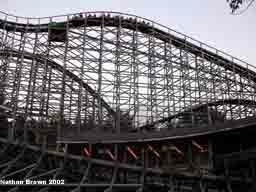 The curves are nice and sharp and fast and the first hill is one of the best woodie hills I have seen. It sure has force, the curves and hills are very powerful and fast, it mabye one of the most powerful woodies I have ever seen. This coaster was great-even better than the Phoenix.